The last missing particle of the Standard Model, the Higgs boson, was discovered in 2012 in the experiments at the Large Hadron Collider. Since then, searching for new, related particles has been underway. Predicted by various theories that go beyond known physics, Higgs bosons with positive or negative electric charge are among the favorites to be observed. But do these particles really exist? At the European Organization for Nuclear Research CERN near Geneva, the Large Hadron Collider’s second run of collisions and collecting data on particles and their decays has just ended. Over the next two years, the accelerator will undergo maintenance and the upgrades will come to fruition. Meanwhile, physicists intensively analyze data from the just-completed run. Their investigation focuses primarily on the search for elementary particles beyond the Standard Model, such as the electrically charged Higgs boson. 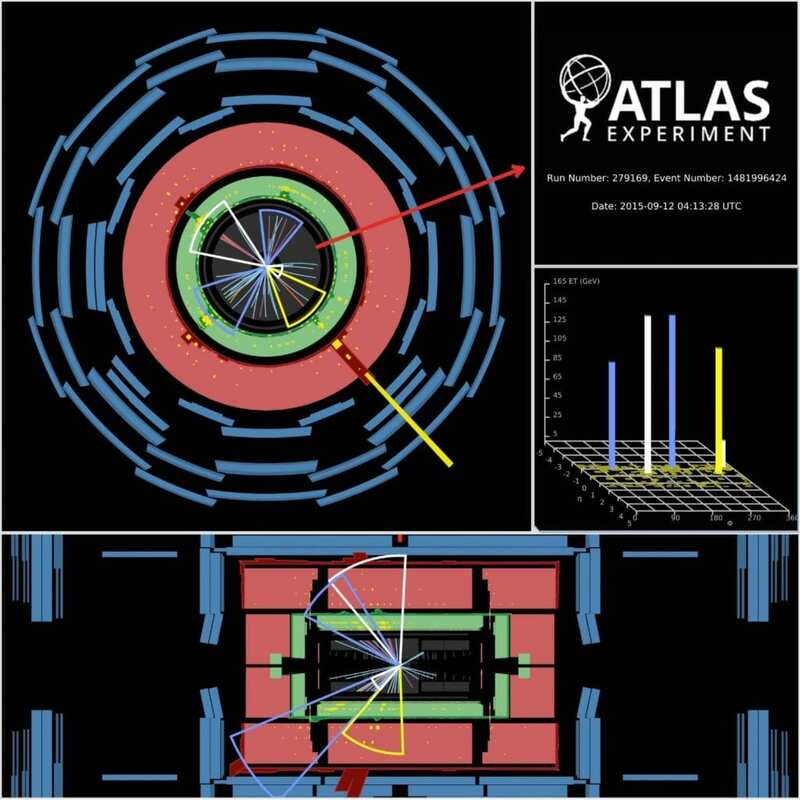 The most recent analysis in this field was carried out by an international team of physicists working within the ATLAS experiment. The group consisted of researchers from the Institute of Nuclear Physics of the Polish Academy of Sciences (IFJ PAN) in Cracow and five other institutions scattered around the world. “The Standard Model is a complex theoretical structure and describes all known elementary particles with excellent accuracy. We know, however, that it works well for experimentally accessible energies. At really high energies, the Standard Model predictions break down and hence the need for new, wider description, so-called new physics,” says Dr. Pawel Bruckman (IFJ PAN) and recalls that classical mechanics, for example, shows similar features. When the energy of moving bodies is low, its description is exact. However, when the speed becomes comparable to the speed of light, Newtonian physics must give way to relativistic theories. Discovered in 2012 by ATLAS and CMS experiments, the neutral Higgs boson confirmed the existence of the mechanism necessary for the Standard Model consistency. Physicists, however, are aware that this particle may be only part of a wider Higgs sector, predicted by most theories that go beyond modern particle physics. In the most popular supersymmetric theories (where each known particle has an exotic, more-massive super-partner) there are five Higgs bosons. Three of them, including the standard one, are electrically neutral, while the other two are electrically charged (negatively and positively). “We have been exploring a very wide range of masses. The mass of the proton, i.e. the nucleus of the hydrogen, is about one gigaelectronvolt. In turn, the mass of the quark t, the most massive of the so far discovered elementary particles, is 173 gigaelectronvolts. We were looking for traces of the existence of a charged higgs in the mass range from 90 gigaelectronvolts up to 2000 gigaelectronvolts,” explains the PhD student Marzieh Bahmani (IFJ PAN). The team with Cracow researchers focused on those collision events between quarks and gluons, in which the charged Higgs bosons would be produced together with the t quark, and then decayed into a tau lepton (a much more massive equivalent of the electron) and its associated neutrino. In such events, a few neutrinos are emitted. These particles interact weakly with matter and are invisible to the detectors. Therefore, during the selection of decays, the amount of missing energy that neutrinos would carry away was important. For the purpose of the analysis, Cracow researchers, financed by the OPUS grant from the Polish National Science Center, developed and optimized a multivariate discriminant method. The technique, based on many carefully selected variables and correlations between them, maximizes the discrimination of the expected signal from the overwhelming background. “Within the current sensitivity, we can say at the 95% confidence level that in the selected range of masses we have not observed charged Higgs bosons. This is a very strong limitation on the new theories. We intend to improve it even further in the next round of the analysis, by taking into account all data from the recently completed second run of the LHC accelerator. It is still possible that the charged Higgs is hidden somewhere in the mass range covered by our analysis, but we are not yet sensitive enough to see its signal,” says Dr. Anna Kaczmarska (IFJ PAN). The results of the analysis, published in the Journal of High Energy Physics, are particularly valuable to help selecting theoretical models that try to go beyond known physics. The parameter space of these models has been significantly narrowed. As a consequence, their predictions will be more precise and easier to verify. The Henryk Niewodniczanski Institute of Nuclear Physics (IFJ PAN) is currently the largest research institute of the Polish Academy of Sciences. The broad range of studies and activities of IFJ PAN includes basic and applied research, ranging from particle physics and astrophysics, through hadron physics, high-, medium-, and low-energy nuclear physics, condensed matter physics (including materials engineering), to various applications of methods of nuclear physics in interdisciplinary research, covering medical physics, dosimetry, radiation and environmental biology, environmental protection, and other related disciplines. The average yearly yield of the IFJ PAN encompasses more than 600 scientific papers in the Journal Citation Reports published by the Thomson Reuters. The part of the Institute is the Cyclotron Centre Bronowice (CCB) which is an infrastructure, unique in Central Europe, to serve as a clinical and research centre in the area of medical and nuclear physics. IFJ PAN is a member of the Marian Smoluchowski Kraków Research Consortium: “Matter-Energy-Future” which possesses the status of a Leading National Research Centre (KNOW) in physics for the years 2012-2017. The Institute is of A+ Category (leading level in Poland) in the field of sciences and engineering. The ATLAS collaboration, Aaboud, M., Aad, G. et al. How does brain structure influence performance on language tasks?